(CHICAGO) March 2013 – North Shore restaurant Prairie Grass Cafe (601 Skokie Blvd. Northbrook, IL 847-205-4433) has designed specials for the month of March inspired by the spirit of the season. Chefs Sarah Stegner and George Bumbaris have created a an Easter Brunch Buffet, a spotlight dessert of the month and more. 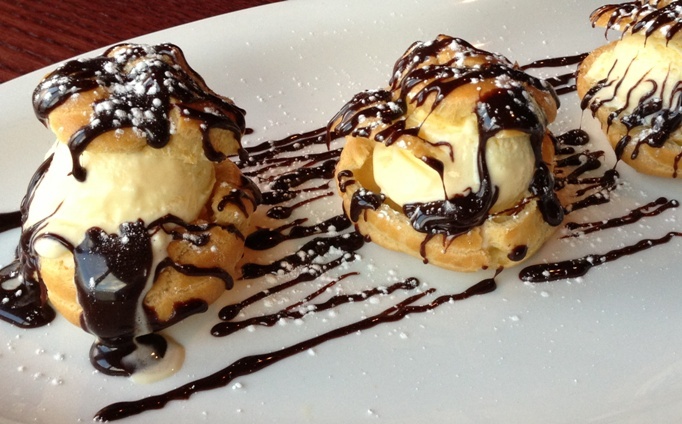 Beginning the first week of March, Prairie Grass Cafe will be serving a special treat: Homemade Profiteroles filled with Vanilla Bean Ice Cream and topped with a Valrhona Chocolate Sauce ($8.50). This decadent yet refreshing dish is served in sets of three, perfect to share or splurge on for yourself. Chefs Sarah and George want to cook their favorite meals and share them with you. Join them every Thursday in March for a tour of some of their favorite dishes. On March 21, Prairie Grass Cafe offers Roasted Squab with Lentil Ragout and mushrooms ($26). Lastly, for the final Thursday on March 28 dine on their version of Korean Short Ribs with mashed caramelized parsnips and char-grilled onions ($28). For those looking for the perfect brunch spot in the suburbs, Prairie Grass Cafe will be a great place to spend the holiday. Easter Brunch begins at 10 a.m. and continues until 2 p.m. March 31. Chefs Sarah Stegner and George Bumbaris will serve a scrumptious Easter Brunch featuring their Signature PGC Benedict along with a generous and delicious buffet. The brunch includes made-to-order omelets available in a range of toppings such as: homemade crumbled Maple Creek Farm Chorizo, poblano peppers, spring onions, mushrooms and more. Prairie Grass Cafe’s puts its own spin on traditional brunch favorites with the Applewood Smoked Maple Creek Farm Bacon, Honey Glazed Bone-In Ham and Deviled Farm Eggs. The house moussaka, with layers of eggplant, potato and braised lamb topped with béchamel sauce also is available. Additionally, crab cakes, fresh salads and a mix of breads complete the spread. To end on a sweet note, the dessert buffet features sliced fruit, Mom’s Homemade Banana Cream Pie and a Crêpe station with two sweet filling options. Price for adults is $45 and $15 for children under 10 years. The restaurant also will be open for dinner, offering both the regular menu and Easter specials. The Easter specials start with an appetizer of Wilted Dandelion Greens with local bacon and Parmesan and balsamic reduction on crostini ($9). As a main course, guests can choose from Sautéed Red Snapper with citrus and fennel salad and a citrus butter sauce ($34) or Spring Lamb Kabobs with Arugula Peso and Basmati Rice ($28). The dessert course features a Carrot Cake with cream cheese frosting ($7). For Easter reservations call Prairie Grass Cafe at (847) 205-4433.